As an Academy, we aim to encourage and reward consistently positive behaviour for learning amongst our students. 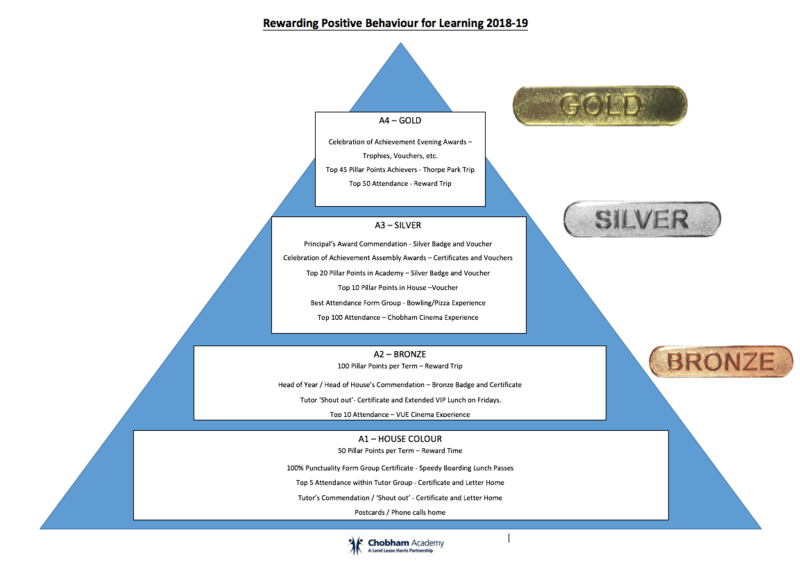 The Chobham Rewards system, created in conjunction with our Heads of Years, the Student Commission, the Y10 Harris Experience cohort and the Academy Prefects (see Student Leadership), consists of four levels based on the accumulation of Pillar Points. Pillar Points categories and rewards are linked to the criteria of the Chobham Pillars which are aspirational and not basic expectations of student behaviour, as well as the House system, with each Pillar Point also equating to one House Point. This ensures a fair and transparent system which rewards consistency of behaviours, whilst encouraging healthy competition between our six newly established Houses. Students can earn Pillar Points during a lesson or across a series of lessons or can be put forward for a Head of Year, Director of Learning, Head of House and Principal’s commendation. Commendations are collected each week from teaching staff and support staff and are given for attainment, progress, effort, attitude or achievement in a subject or extra-curricular activity. A regular draw from winners is also made in assembly with these students being awarded an additional small prize. Based on the number of Pillar Points acquired, students become eligible to receive a variety of prizes and vouchers, as outlined below. Students also receive a variety of prestigious badges in recognition of their achievements, ie 100 merits within a term earns them a Bronze badge, as well as being invited to attend a variety of rewards trip, e.g Thorpe Park. Reward Time (top 50 students) at the end of each half term (October/February/May) – e.g. film showing in the theatre, bowling, etc. Reward Trip (top 20 students) at the end of each term (Christmas/Easter/Summer) – this is planned by Heads of Year and is appropriately suited to the interests of the year. At the end of each term, the Pillar Points resets allowing students to consistently pursue positive behaviours. Below you will find our ‘REWARDS TRIANGLE’, which summarises the 4 four reward levels and the rewards on offer. Please contact Mr Stander, Assistant Principal for Behaviour and Inclusion, by email on t.stander@chobhamacademy.org.uk, if you have any queries.